We hope you have had a fabulous new start to 2018 and are on track for an awesome year ahead. This is the first time writing here for, well…. a long time! 2017 had rather a lot going on. Many personal changes too, including my engagement to a wonderful man and many new adventures. We also have had an amazing move! We are now in the beautiful countryside of the Surrey Hills. We found our forever home and an awesome base for our company and my therapy practice, so now feeling inspired and ready to go! Firstly, we would like to say a very big thank you for all your continued support of The Aromatree Company. We value your business and love the fact that you enjoy using our creams and want to use quality, handmade products from natural ingredients. Since The Aromatree Company was founded in 2010 we have never increased our prices, despite extensive price hikes in some of our natural ingredients and indeed, across the board in all areas of production. However, we have absorbed the differences over the years and have taken the hit but now have to put changes in place. 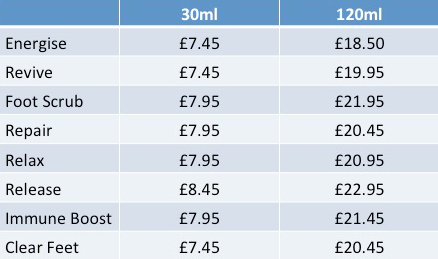 Our pricing structure we now have takes into account the different raw ingredient costs across our range so we now have different prices for each product to accommodate this. These will be effective from 1st February 2018 so if you would like to take advantage of the current prices then you have time to plan to do so. Price increases are an unavoidable part of doing business, but we hope that you would like to continue to use our range of multi award winning creams, as we want to continue to grow and offer you the best ingredients from trustworthy, ethical companies. We will not compromise on this. If you are a therapist and use our range in your treatments or would like to retail our range then please call or email for our updated trade information. Remember to give us a call on 07906968422 or order online if you wish to take advantage of the current prices until 1st February!